Thank you to all who attended INSPIRE at IMSH. Please see the link for ALERT presentations files includingcontact information on each project presented. Special thanks to Dr. Terry Klaassen for INSPIRING all of us with his work on knowledge translation and dissemination through TREKK and PERC! INSPIRE members presented outstanding work during IMSH including participation in the research summit, workshops, innovation presentations, posters and panels. 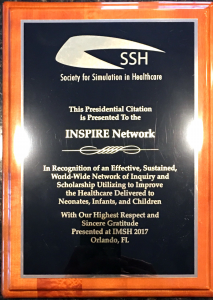 INSPIRE was recognized as a leader in Simulation-based research with a Presidential Citation and an award by the Emergency Medicine Special Interest group. Additionally INSPIRE members Adam Cheng, Aaron Calhoun, Ellen Deutsch, Peter Diekmann, Walter Eppich and Debra Netel were members of the inaugural group of SSH Fellows.